Diamond in the rough, bring your imagination along with your architect as you will need to redraw the plans. This home is deep into construction but is at the perfect stage to make it your own before drywall and finishing stages begin. Bring your own builder to finish out to your taste. Soaring ceilings, floor to ceiling windows, large rooms and huge closets. 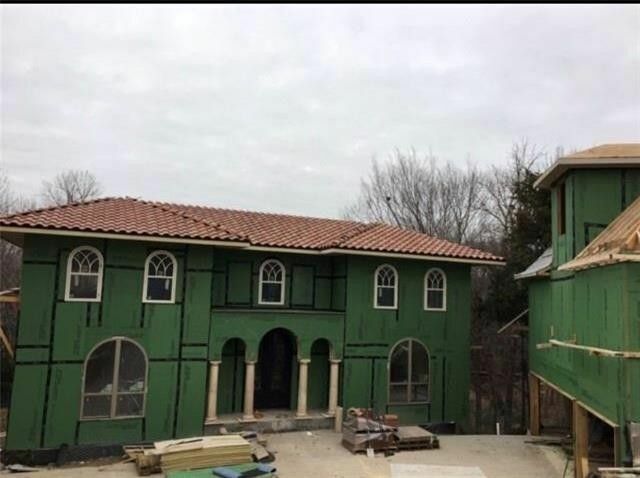 Main floor is approx 2400 square ft with approx 1300 below which includes 3 bd 2 full baths, 2nd kitchen and indoor-outdoor entertaining spaces. Theres also approx 1300 square ft available on the top floor. Enjoy the detached 3 car garage with approx 1200 square ft of guest quarters above. Forest like setting in a gated, tennis & swim community. Directions: I30 to Rockwall, take first exit to Horizon Rd, turn right, follow to Ridge, turn right. Follow to Henry M Chandler and turn right. Turn right into guard gate entrance. Take a left a Yacht Club and follow to Ranger, take a right. Shamrock is on the right.